Holland, Michigan (December 1, 2016) – National Bulk Equipment, Inc. (NBE) – This NBE bulk bag unloader was designed, engineered, and built to address specific dust reduction, and process operation efficiency requirements identified by NBE during the application assessment. A non-NBE unit, that was previously in operation, often caused material dust release during the bag spouting sequence; presenting operator hazards and slowing process cycle times and changeovers. In response, NBE developed a process-specific bulk bag discharger that enables the operator to easily and properly spout the bulk bag while simultaneously enclosing the bag spout interface within the NBE E3® closed-cycle dust recovery system. The NBE E3® closed-cycle dust recovery system prevents the release of dust into the work area by recovering within the E3® the contained dust and re-introducing the material dust back into the discharge path. As material flow moves from the bulk bag through the bag spout interface, the suspension system of the E3® automatically reacts to the lessening volume of material in the bulk bag and lowers the bag spout interface to pull the bag into a taut, conical shape. 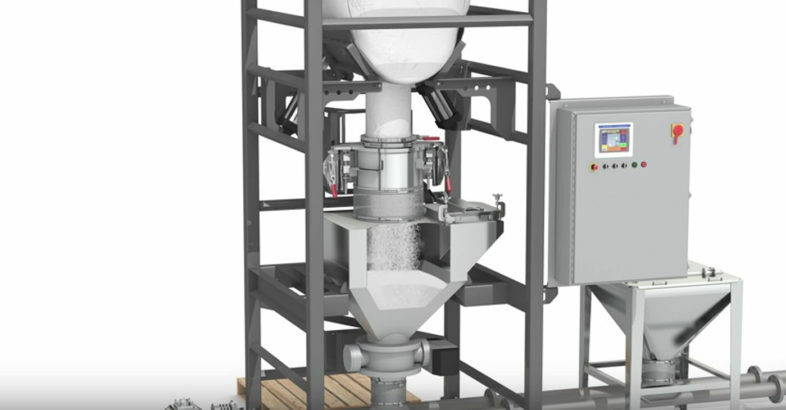 This bag-shaping function of the E3® ensures no residual material remains in the bulk bag and, as a result, no residual material dust is released during unspouting. Personnel, product, and process operations are protected from harmful contaminants. 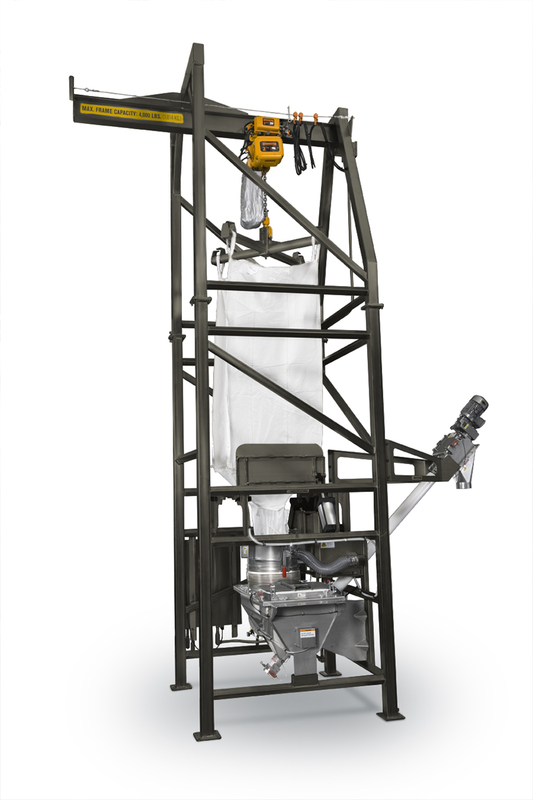 This NBE bulk bag discharger unloads various semi free-flowing, hygroscopic, contaminable powders at a rate of 6,000 lbs/hr. Changeover times were significantly shortened due to reduced equipment cleaning times and improvements in operator bag spouting efficiency. This bulk bag discharging system is built on the NBE integrated construction and controls infrastructure. The complete process sequence, including: bulk bag loading and conditioning, material size reduction, and feeding, operates on paired, process-specific structural framework chassis with all automation and control functions centralized to a single, menu-driven HMI to enable standardized and system-wide data reporting. The NBE integrated construction and controls infrastructure provides the basis for reduced total cost of ownership, relative to the common systems integration concept of bolt-together, divergent units of equipment and controls, while also improving process performance and the accuracy of production data shared throughout the enterprise. This NBE bulk bag unloader was built based on HACCP assessments that guided the determination of the framework and component materials of construction. This pro-active effort ensured the highest compatibility with the specifications and conditions of the process, material, and production environment.